For other uses, see Kanishka (disambiguation). Kanishka I (Sanskrit: कनिष्क), or Kanishka the Great, an emperor of the Kushan dynasty in the second century (c. 127–150 CE), is famous for his military, political, and spiritual achievements. 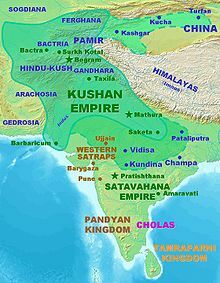 A descendant of Kujula Kadphises - founder of the Kushan empire - Kanishka came to rule an empire in Bactria extending from Turfan in the Tarim Basin to Pataliputra on the Gangetic plain. The main capital of his empire was located at Puruṣapura in Gandhara, with another major capital at Kapisa. His conquests and patronage of Buddhism played an important role in the development of the Silk Road, and in the transmission of Mahayana Buddhism from Gandhara across the Karakoram range to China. Earlier scholars believed that Kanishka ascended the Kushan throne in 78 CE, and that this date was used as the beginning of the Saka calendar era. However, historians no longer regard this date as that of Kanishka's accession. Falk estimates that Kanishka came to the throne in 127 CE. Kanishka was the successor of Vima Kadphises, as demonstrated by an impressive genealogy of the Kushan kings, known as the Rabatak inscription. The connection of Kanishka with other Kushan rulers is described in the Rabatak inscription as Kanishka makes the list of the kings who ruled up to his time: Kujula Kadphises as his great-grandfather, Vima Taktu as his grandfather, Vima Kadphises as his father, and himself Kanishka: "for King Kujula Kadphises (his) great grandfather, and for King Vima Taktu (his) grandfather, and for King Vima Kadphises (his) father, and *also for himself, King Kanishka". 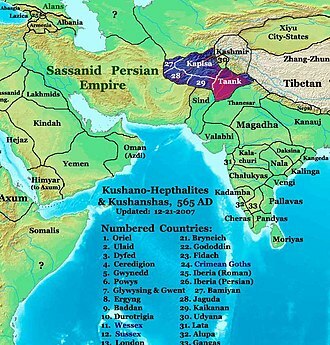 Kanishka's empire was certainly vast. It extended from southern Uzbekistan and Tajikistan, north of the Amu Darya (Oxus) in the north west to Pakistan and Northern India, as far as Mathura in the south east (the Rabatak inscription even claims he held Pataliputra and Sri Champa), and his territory also included Kashmir, where there was a town Kanishkapur, named after him not far from the Baramula Pass and which still contains the base of a large stupa. Bronze coin of Kanishka, found in Khotan, modern China. Knowledge of his hold over Central Asia is less well established. The Book of the Later Han, Hou Hanshu, states that general Ban Chao fought battles near Khotan with a Kushan army of 70,000 men led by an otherwise unknown Kushan viceroy named Xie (Chinese: 謝) in 90 AD. Though Ban Chao claimed to be victorious, forcing the Kushans to retreat by use of a scorched-earth policy, the region fell to Kushan forces in the early 2nd century. As a result, for a short period (until the Chinese regained control c. 127 AD) the territory of the Kushans extended as far as Kashgar, Khotan and Yarkand, which were Chinese dependencies in the Tarim Basin, modern Xinjiang. Several coins of Kanishka have been found in the Tarim Basin. Controlling both the land (the Silk Road) and sea trade routes between South Asia and Rome seems to have been one of Kanishka's chief imperial goals. Gold coin of Kanishka I with the Hellenistic divinity Helios. (c. 120 AD). Obverse: Kanishka standing, clad in heavy Kushan coat and long boots, flames emanating from shoulders, holding a standard in his left hand, and making a sacrifice over an altar. 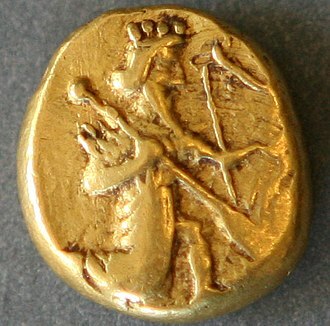 Greek legend ΒΑΣΙΛΕΥΣ ΒΑΣΙΛΕΩΝ ΚΑΝΗϷΚΟΥ "[coin] of Kanishka, king of kings". Reverse: Standing Helios in Hellenistic style, forming a benediction gesture with the right hand. Legend in Greek script: ΗΛΙΟΣ Helios. Kanishka monogram (tamgha) to the left. Kanishka's coins portray images of Indian, Greek, Iranian and even Sumero-Elamite divinities, demonstrating the religious syncretism in his beliefs. Kanishka's coins from the beginning of his reign bear legends in Greek language and script and depict Greek divinities. Later coins bear legends in Bactrian, the Iranian language that the Kushans evidently spoke, and Greek divinities were replaced by corresponding Iranian ones. All of Kanishka's coins – even ones with a legend in the Bactrian language – were written in a modified Greek script that had one additional glyph (Ϸ) to represent /š/ (sh), as in the word 'Kushan' and 'Kanishka'. On his coins, the king is typically depicted as a bearded man in a long coat and trousers gathered at the ankle, with flames emanating from his shoulders. He wears large rounded boots, and is armed with a long sword similar to a scimitar as well as a lance. He is frequently seen to be making a sacrifice on a small altar. The lower half of a lifesize limestone relief of Kanishka similarly attired, with a stiff embroidered surplice beneath his coat and spurs attached to his boots under the light gathered folds of his trousers, survived in the Kabul Museum until it was destroyed by the Taliban. A few coins at the beginning of his reign have a legend in the Greek language and script: ΒΑΣΙΛΕΥΣ ΒΑΣΙΛΕΩΝ ΚΑΝΗϷΚΟΥ, basileus basileon kaneshkou "[coin] of Kanishka, king of kings." The inscriptions in Greek are full of spelling and syntactical errors. Kushan Carnelian seal representing the Iranian divinity Adsho (ΑΘϷΟ legend in Greek letters), with triratana symbol left, and Kanishka's dynastic mark right. The divinity uses stirrups. ΟΗϷΟ (oesho, Shiva). A recent study indicate that oesho may be Avestan Vayu conflated with Shiva. Gold coin of Kanishka I with a representation of the Buddha (c.120 AD). Obv: Kanishka standing.., clad in heavy Kushan coat and long boots, flames emanating from shoulders, holding standard in his left hand, and making a sacrifice over an altar. Kushan-language legend in Greek script (with the addition of the Kushan Ϸ "sh" letter): ϷΑΟΝΑΝΟϷΑΟ ΚΑΝΗϷΚΙ ΚΟϷΑΝΟ ("Shaonanoshao Kanishki Koshano"): "King of Kings, Kanishka the Kushan". Rev: Standing Buddha in Hellenistic style, forming the gesture of "no fear" (abhaya mudra) with his right hand, and holding a pleat of his robe in his left hand. Legend in Greek script: ΒΟΔΔΟ "Boddo", for the Buddha. Kanishka monogram (tamgha) to the right. Kanishka's reputation in Buddhist tradition regarded with utmost importance as he not only believed in Buddhism but also encouraged its teachings as well, as a proof of it, he administered the 4th Buddhist Council in Kashmir as the head of the council. It was presided by Vasumitra and Ashwaghosha. Images of the Buddha based on 32 physical signs were made during his time. He encouraged both Gandhara school of Greco-Buddhist Art and the Mathura school of Hindu art (an inescapable religious syncretism pervades Kushana rule). Kanishka personally seems to have embraced both Buddhism and the Persian attributes but he favored Buddhism more as it can be proven by his devotion to the Buddhist teachings and prayer styles depicted in various books related to kushan empire. His greatest contribution to Buddhist architecture was the Kanishka stupa at Peshawar, Pakistan. Archaeologists who rediscovered the base of it in 1908–1909 ascertained that this stupa had a diameter of 286 feet (87 metres). Reports of Chinese pilgrims such as Xuanzang indicate that its height was 600 to 700 (Chinese) "feet" (= roughly 180–210 metres or 591–689 ft.) and was covered with jewels. Certainly this immense multi-storied building ranks among the wonders of the ancient world. Kanishka is said to have been particularly close to the Buddhist scholar Ashvaghosha, who became his religious advisor in his later years. The Buddhist coins of Kanishka are comparatively rare (well under one percent of all known coins of Kanishka). Several show Kanishka on the obverse and the Buddha standing on the reverse. A few also show the Shakyamuni Buddha and Maitreya. Like all coins of Kanishka, the design is rather rough and proportions tend to be imprecise; the image of the Buddha is often slightly overdone, with oversize ears and feet spread apart in the same fashion as the Kushan king. Bronze standing Buddha with features similar to those of Kanishka's coins. Gandhara, usually dated 3rd–4th century. 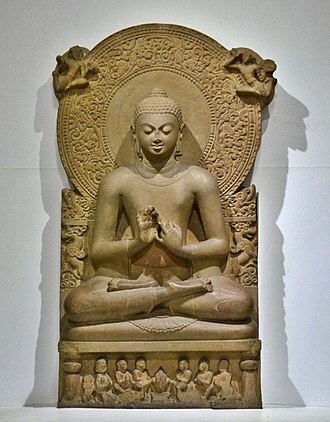 The Buddha, in Hellenistic style, holds the left corner of his cloak in his hand, and forms the abhaya mudra (Musée Guimet). Depiction of the Buddha (with legend ΒΟΔΔΟ "Boddo") in Kanishka's coinage. Only six Kushan coins of the Buddha are known in gold (the sixth one is the centerpiece of an ancient piece of jewellery, consisting of a Kanishka Buddha coin decorated with a ring of heart-shaped ruby stones). All these coins were minted in gold under Kanishka I, and are in two different denominations: a dinar of about 8 gm, roughly similar to a Roman aureus, and a quarter dinar of about 2 gm. (about the size of an obol). The Buddha is represented wearing the monastic robe, the antaravasaka, the uttarasanga, and the overcoat sanghati. The ears are extremely large and long, a symbolic exaggeration possibly rendered necessary by the small size of the coins, but otherwise visible in some later Gandharan statues of the Buddha typically dated to the 3rd–4th century CE (illustration, left). He has an abundant topknot covering the usnisha, often highly stylised in a curly or often globular manner, also visible on later Buddha statues of Gandhara. In general, the representation of the Buddha on these coins is already highly symbolic, and quite distinct from the more naturalistic and Hellenistic images seen in early Gandhara sculptures. On several designs a mustache is apparent. The palm of his right hand bears the Chakra mark, and his brow bear the urna. An aureola, formed by one, two or three lines, surrounds him. The full gown worn by the Buddha on the coins, covering both shoulders, suggests a Gandharan model rather than a Mathuran one. Depictions of the "Shakyamuni Buddha" (with legend ϷΑΚΑΜΑΝΟ ΒΟΔΔΟ "Shakamano Boddo") in Kanishka's coinage. The Shakyamuni Buddha (with the legend "Sakamano Boudo", i.e. 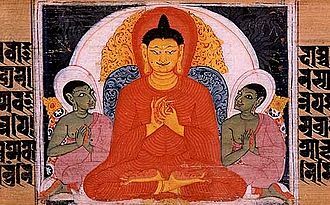 Shakamuni Buddha, another name for the historic Buddha Siddharta Gautama), standing to front, with left hand on hip and forming the abhaya mudra with the right hand. All these coins are in copper only, and usually rather worn. The gown of the Shakyamuni Buddha is quite light compared to that on the coins in the name of Buddha, clearly showing the outline of the body, in a nearly transparent way. These are probably the first two layers of monastic clothing the antaravasaka and the uttarasanga. Also, his gown is folded over the left arm (rather than being held in the left hand as above), a feature only otherwise known in the Bimaran casket and suggestive of a scarf-like uttariya. He has an abundant topknot covering the ushnisha, and a simple or double halo, sometimes radiating, surrounds his head. 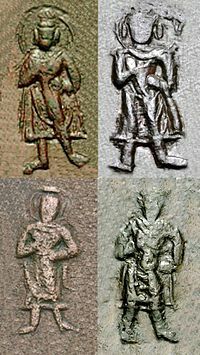 Depictions of "Maitreya" (with legend ΜΕΤΡΑΓΟ ΒΟΔΔΟ "Metrago Boddo") in Kanishka's coinage. The Bodhisattva Maitreya (with the legend "Metrago Boudo") cross-legged on a throne, holding a water pot, and also forming the Abhaya mudra. These coins are only known in copper and are quite worn out . On the clearest coins, Maitreya seems to be wearing the armbands of an Indian prince, a feature often seen on the statuary of Maitreya. The throne is decorated with small columns, suggesting that the coin representation of Maitreya was directly copied from pre-existing statuary with such well-known features. The qualification of "Buddha" for Maitreya is inaccurate, as he is instead a Bodhisattva (he is the Buddha of the future). The iconography of these three types is very different from that of the other deities depicted in Kanishka's coinage. Whether Kanishka's deities are all shown from the side, the Buddhas only are shown frontally, indicating that they were copied from contemporary frontal representations of the standing and seated Buddhas in statuary. Both representations of the Buddha and Shakyamuni have both shoulders covered by their monastic gown, indicating that the statues used as models were from the Gandhara school of art, rather than Mathura. Several Buddhist statues are directly connected to the reign of Kanishka, such as several Bodhisattva statues from the Art of Mathura, while a few other from Gandhara are inscribed with a date in an era which is now thought to be the Yavana era, starting in 186 to 175 BCE. Buddha from Loriyan Tangai with inscription mentionning the "year 318", thought to be 143 CE..
A Buddha from Loriyan Tangai from the same period. Bodhisattva of Set-Mahet, with inscription mentionning the reign of Kanishka or Huvishka. Bala Bodhisattva, Sarnath, inscribed "Year 3 of Kanishka". Kosambi Bodhisattva, inscribed "Year 2 of Kanishka". The "Kanishka casket", dated to 127 CE, with the Buddha surrounded by Brahma and Indra, and Kanishka standing at the center of the lower part, British Museum. Remnants of the Kanishka stupa. Detail of Kanishka, surrounded by the Iranian Sun-God and Moon-God, on the Kanishka casket. British Museum. Buddha relics from Kanishka's stupa in Peshawar, Pakistan, sent by the British to Mandalay, Burma in 1910. The "Kanishka casket" or "Kanishka reliquary", dated to the first year of Kanishka's reign in 127 CE, was discovered in a deposit chamber under Kanishka stupa, during the archaeological excavations in 1908–1909 in Shah-Ji-Ki-Dheri, just outside the present-day Ganj Gate of the old city of Peshawar. It is today at the Peshawar Museum, and a copy is in the British Museum. It is said to have contained three bone fragments of the Buddha, which are now housed in Mandalay, Burma. "(*mahara)jasa kanishkasa kanishka-pure nagare aya gadha-karae deya-dharme sarva-satvana hita-suhartha bhavatu mahasenasa sagharaki dasa agisala nava-karmi ana*kanishkasa vihare mahasenasa sangharame"
The text is signed by the maker, a Greek artist named Agesilas, who oversaw work at Kanishka's stupas (caitya), confirming the direct involvement of Greeks with Buddhist realisations at such a late date: "The servant Agisalaos, the superintendent of works at the vihara of Kanishka in the monastery of Mahasena" ("dasa agisala nava-karmi ana*kaniskasa vihara mahasenasa sangharame"). The lid of the casket shows the Buddha on a lotus pedestal, and worshipped by Brahma and Indra. The edge of the lid is decorated by a frieze of flying geese. The body of the casket represents a Kushan monarch, probably Kanishka in person, with the Iranian sun and moon gods on his side. On the sides are two images of a seated Buddha, worshiped by royal figures, can be assumed as Kanishka. A garland, supported by cherubs goes around the scene in typical Hellenistic style. The attribution of the casket to Kanishka has been recently disputed, essentially on stylistic ground (for example the ruler shown on the casket is not bearded, to the contrary of Kanishka). Instead, the casket is often attributed to Kanishka's successor Huvishka. Coin of Kanishka with the Bodhisattva Maitreya "Metrago Boudo". "A desire thus arose in [Kanishka to build a vast stupa]….at that time the four world-regents learnt the mind of the king. 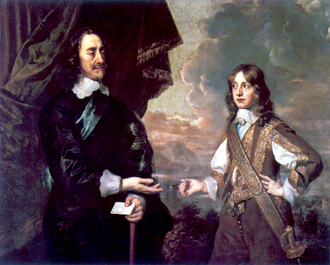 So for his sake they took the form of young boys…. [and] began a stūpa of mud....the boys said to [Kanishka] ‘We are making the Kaṇiṣka-stūpa.’….At that time the boys changed their form....[and] said to him, ‘Great king, by you according to the Buddha's prophecy is a Saṅghārāma to be built wholly (?) with a large stūpa and hither relics must be invited which the meritorious good beings...will bring." "Kaṇiṣka became sovereign of all Jambudvīpa (Indian subcontinent) but he did not believe in Karma, but he treated Buddhism with honor and respect as he himself converted to Buddhism intrigued by the teachings and scriptures of it. When he was hunting in the wild country a white hare appeared; the king gave a chase and the hare suddenly disappeared at [the site of the future stupa]…. [when the construction of the stūpa was not going as planned] the king lost his patience and took the matter in his own hands and started resurrecting the plans precisely, thus completing the stupas with utmost perfection and perseverance. These two stupas are still in existence and were resorted to for cures by people afflicted with diseases." King Kanishka because of his deeds was highly respected, regarded, honored by all the people he ruled and governed and was regarded the greatest king who ever lived because of his kindness, humbleness and sense of equality and self-righteousness among all aspects. Thus such great deeds and character of the king Kanishka made his name immortal and thus he was regarded "THE KING OF KINGS"
Kanishka's expansion into the Tarim Basin probably initiated the transmission of Buddhism to China. Buddhist monks from the region of Gandhara played a key role in the development and the transmission of Buddhist ideas in the direction of northern Asia from the middle of the 2nd century CE. The Kushan monk, Lokaksema (c. 178 CE), became the first translator of Mahayana Buddhist scriptures into Chinese and established a translation bureau at the Chinese capital Loyang. Central Asian and East Asian Buddhist monks appear to have maintained strong exchanges for the following centuries. 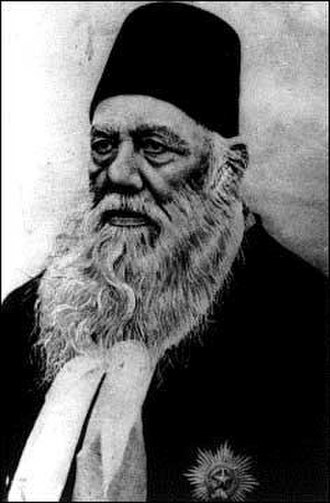 Kanishka was probably succeeded by Huvishka. How and when this came about is still uncertain.It is a fact that there was only one king named Kanishka in the whole Kushan legacy. The inscription on The Sacred Rock of Hunza also shows the signs of Kanishka. Coin of Kanishka found at Ahin Posh. ^ Falk (2001), pp. 121–136. Falk (2004), pp. 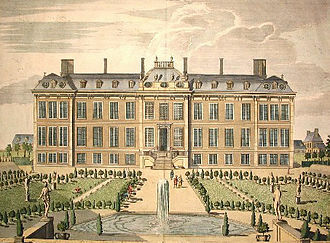 167–176. ^ Findeisen, Raoul David; Isay, Gad C.; Katz-Goehr, Amira (2009). At Home in Many Worlds: Reading, Writing and Translating from Chinese and Jewish Cultures : Essays in Honour of Irene Eber. Otto Harrassowitz Verlag. p. 138. ISBN 9783447061353. ^ Gnoli (2002), pp. 84–90. ^ Sims-Williams and Cribb (1995/6), pp.75–142. ^ Sims-Williams (1998), pp. 79–83. ^ Sims-Williams and Cribb (1995/6), p. 80. ^ "The Rabatak inscription claims that in the year 1 Kanishka I's authority was proclaimed in India, in all the satrapies and in different cities like Koonadeano (Kundina), Ozeno (Ujjain), Kozambo (Kausambi), Zagedo (Saketa), Palabotro (Pataliputra) and Ziri-Tambo (Janjgir-Champa). These cities lay to the east and south of Mathura, up to which locality Wima had already carried his victorious arm. Therefore they must have been captured or subdued by Kanishka I himself." Ancient Indian Inscriptions, S. R. Goyal, p. 93. See also the analysis of Sims-Williams and J. Cribb, who had a central role in the decipherment: "A new Bactrian inscription of Kanishka the Great", in Silk Road Art and Archaeology No. 4, 1995–1996. Also see, Mukherjee, B. N. "The Great Kushanan Testament", Indian Museum Bulletin. ^ Chavannes, (1906), p. 232 and note 3. ^ Hill (2009), p. 11. ^ Wood (2002), illus. p. 39. ^ Sims-Williams (online) Encyclopedia Iranica. ^ H. Humbach, 1975, p.402-408. K. Tanabe, 1997, p.277, M. Carter, 1995, p. 152. J. Cribb, 1997, p. 40. References cited in De l'Indus à l'Oxus. ^ Hargreaves (1910–11), pp. 25–32. ^ Spooner, (1908–9), pp. 38–59. ^ Kumar (1973), p. 95. ^ Kumar (1973), p. 91. ^ Kumar (1973). p. 89. ^ Xuanzang, quoted in: Kumar (1973), p. 93. Bopearachchi, Osmund (2003). De l'Indus à l'Oxus, Archéologie de l'Asie Centrale (in French). Lattes: Association imago-musée de Lattes. ISBN 978-2-9516679-2-1. Kulke, Hermann; Rothermund, Dietmar (1998). A history of India. London; New York: Routledge. ISBN 978-0-415-15481-9. Wikimedia Commons has media related to Kanishka I. This is about the historical calendar era. For the Śaka calendar of 1957, see Indian national calendar, the Shaka era is a historical calendar era, corresponding to Julian year 78. It is known as Shalivahana Śaka era or rtgs, Mahasakkarat Greater Era), the origin of the Shaka era is highly controversial. The other is called Saka Era of 78 AD, or simply Saka Era, a parallel northern India system is the Vikrama Era, which is related to the Bikrami calendar linked to Vikramaditya. The beginning of the Shaka era is now equated to the ascension of king Chashtana in 78 CE. His inscriptions, dated to the years 11 and 52, have found at Andhau in Kutch region. These years are interpreted as Shaka years 11 and 52, a previously more common view was that the beginning of the Shaka era corresponds to the ascension of Kanishka I in 78 CE. However, the latest research by Henry Falk indicates that Kanishka ascended the throne in 127 CE, Kanishka was not a Shaka, but a Kushana ruler. Other historical candidates have included such as Vima Kadphises, Vonones. Sircar suggests that the association of the northern king Vikramaditya with Vikrama era might have led the southern scholars to fabricate a similar legend of their own. Another similar account claims that the legendary emperor Vikramaditya defeated the Shakas in 78 CE, and this legend has been mentioned in the writings of Brahmagupta, Al-Biruni, and others. However, this is an obvious fabrication, over time, the word Shaka became generic, and came to be mean an era, the era thus came to be known as Shalivahana Shaka. The earliest known users of the era are the Western Satraps, from the reign of Rudrasimha I, they recorded the date of minting of their coins in the Shaka era, usually written on the obverse behind the kings head in Brahmi numerals. The use of the era survived into the Gupta period. It was in use by the 6th to 7th centuries, e. g. in the works of Varāhamihira and Brahmagupta. The calendar era remained in use in India and Southeast Asia throughout the medieval period and it was used by Javanese courts until 1633, when it was replaced by Anno Javanico, a hybrid Javanese-Islamic system. The history of Peshawar, a region of modern-day Khyber Pakhtunkhwa, covers thousands of years. The region was known as Puruṣapura in Sanskrit, literally meaning city of men and it found mention in the Zend Avesta as Vaēkərəta, the seventh most beautiful place on earth created by Ahura Mazda. It was known as the jewel of Bactria and held sway over Takshashila. Being among the most ancient cities of the region between Central and South Asia, Peshawar has for centuries been a center of trade between Bactria, South Asia, and Central Asia, Peshawar was known in Sanskrit as Puruṣapura, literally meaning city of men. It found mention in the Zend Avesta as Vaēkərəta, the seventh most beautiful place on earth created by Ahura Mazda It was known as the jewel of Bactria. 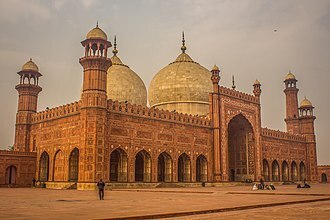 Being among the most ancient cities of the region between Central and South Asia, Peshawar has for centuries been a center of trade between Bactria, South Asia and Central Asia, as an ancient center of learning, the 2nd century BC. 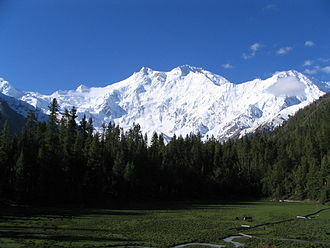 Bakhshali Manuscript used in the Bakhshali approximation was found nearby, Vedic mythology refers to an ancient settlement called Pushkalavati in the area, after Pushkal, presently known as Charsadda. The city that would become Peshawar, called Puruṣapura, was founded by the Kushans. Prior to this period the region was affiliated with Gandhara and was annexed first by the Persian Achaemenid Empire, the city passed into the rule of Alexanders successor, Seleucus I Nicator who ceded it to Chandragupta Maurya, the founder of the Indian Maurya Empire. The inhabitants of Peshewar were mostly Hindu and Buddhist before the arrival of Islam, the area that Peshawar occupies was seized by the Greco-Bactrian king Eucratides I, and was controlled by a series of Greco-Bactrian kings. Peshawar formed the capital of the empire of Gandhara under the Kushan emperor Kanishka I who reigned from at least 127 CE and, perhaps. Peshawar became a centre of Buddhist learning. Kanishka built what was probably the tallest building in the world at the time, the Kanishka stupa was said to be an imposing structure as one travelled down from the mountains of Afghanistan onto the Gandharan plains. Of all the stûpas and temples seen by the travellers, none can compare with this for beauty of form and it was destroyed by lightning and repaired several times. The Tarim Basin is an endorheic basin in northwest China occupying an area of about 1,020,000 km2. 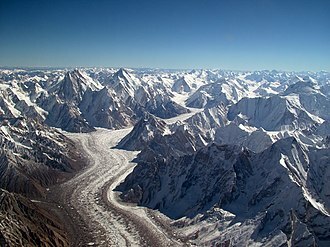 Its northern boundary is the Tian Shan mountain range and its boundary is the Kunlun Mountains on the edge of the Qinghai-Tibet Plateau. The Taklamakan Desert dominates much of the basin, the historical Uyghur name for the Tarim Basin is Altishahr, which means six cities in Uyghur. 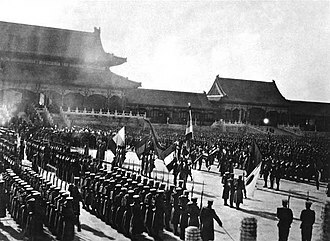 They were governed separately until 1884, north side, The Chinese called this the Tien Shan Nan Lu or Tien Shan South Road, as opposed to the Bei Lu north of the mountains. Along it runs the modern highway and railroad while the middle Tarim River is about 100 km south, Kashgar was where the caravans met before crossing the mountains. Center, Most of the basin is occupied by the Taklamakan Desert which is too dry for permanent habitation, the Yarkand and Aksu Rivers join to form the Tarim River which runs along the north side of the basin. Formerly it continued to Loulan, but some time after 330AD it turned southeast near Korla toward Charkilik, the Tarim ended at the now-dry Lop Nur which occupied a changing position east of Loulan. Eastward is the fabled Jade Gate which the Chinese considered the gateway to the Western Regions, beyond that is Dunhuang with its ancient manuscripts and Anxi at the west end of the Gansu Corridor. The modern road continues east to Tibet, there is no current road east across the Kumtag Desert to Dunhuang, but caravans somehow made the crossing thru the Yangguan pass south of the Jade Gate. Roads and passes and caravan routes, The Southern Xinjiang Railway branches from the Lanxin Railway near Turpan, follows the side of the basin to Kashgar. Roads, The main road from eastern China reaches Urumchi and continues as highway 314 along the side to Kashgar. Highway 315 follows the side from Kashgar to Charkilik and continues east to Tibet. There are currently four north-south roads across the desert,218 runs from Charkilik to Korla along the former course of the Tarim forming an oval whose other end is Kashgar. The Tarim Desert Highway, an engineering achievement, crosses the center from Niya to Luntai. After a major defeat by the Xiongnu, during the 2nd century BCE, the Yuezhi split into two groups, the Greater Yuezhi and Lesser Yuezhi. Following their defeat, the Greater Yuezhi initially migrated northwest into the Ili Valley and they were driven from the Ili Valley by the Wusun and migrated southward to Sogdia and settled in Bactria, where they the defeated the Greco-Bactrian Kingdom. The Greater Yuezhi have consequently often been identified with Bactrian peoples mentioned in classical European sources, like the Tókharioi, during the 1st century BCE, one of the five major Greater Yuezhi tribes in Bactria, the Kushanas, began to subsume the other tribes and neighbouring peoples. The subsequent Kushan Empire, at its peak in the 3rd century CE, the Kushanas played an important role in the development of trade on the Silk Road and the introduction of Buddhism to China. Most of the Lesser Yuezhi appear to have migrated southward into Tibet, some are reported to have settled among the Qiang people in Qinghai, and to have been involved in the Liangzhou Rebellion. Others are said to have founded the city state of Cumuḍa in the eastern Tarim, a fourth group of Lesser Yuezhi may have become part of the Jie people of Shanxi, who established the 4th Century CE Later Zhao state. The philosophical tract Guanzi is now believed to have been compiled around 26 BCE, based on older texts. In the Guanzi, nomadic pastoralists known as the Yúzhī 禺氏 or Niúzhī 牛氏 and they are described as supplying jade to the Chinese. The export of jade from the Tarim Basin, since at least the late 2nd Millennium BCE, is well-documented archaeologically, for example, hundreds of jade pieces found in the Tomb of Fu Hao originated from the Khotan area, on the southern rim of the Tarim Basin. According to the Guanzi, the Yúzhī/Niúzhī, unlike the neighbouring Xiongnu, in the early 4th Century BCE, the Tale of King Mu, Son of Heaven mentions the Yúzhī 禺知. The Yi Zhou Shu makes separate references to the Yúzhī 禺氏 and Yuèdī 月氐, trading the jade and horses for Chinese silk, the Wūzhī were selling these goods to other neighbours. The earliest detailed account of the Yuezhi is found in chapter 123 of the Records of the Great Historian by Sima Qian, essentially the same text appears in chapter 61 of the Book of Han, though Sima Qian has added occasional words and phrases to clarify the meaning. Both texts use the Chinese name Yuezhi, written with the characters yuè moon and shì clan, some scholars have argued that Dunhuang should be Dunhong, a mountain in the Tian Shan, and have placed the original homeland of the Yuezhi 1,000 km further west. The Yuezhi were so powerful that the Xiongnu monarch Touman even sent his eldest son Modu as a hostage to the Yuezhi, the Yuezhi often attacked their neighbour the Wusun to acquire slaves and pasture lands. Wusun originally lived together with the Yuezhi in the region between Dunhuang and Qilian Mountain, the Yuezhi attacked the Wusuns, killed their monarch Nandoumi and took his territory. The son of Nandoumi, Kunmo fled to the Xiongnu and was brought up by the Xiongnu monarch, gradually the Xiongnu grew stronger and war broke out between them and the Yuezhi. Vima Kadphises was a Kushan emperor from approximately 90–100 CE. According to the Rabatak inscription, he was the son of Vima Takto, emperor Vima Kadphises expanded the Kushan territory in Afghanistan and north-west India. He was the Kushan emperor to first introduce gold coinage, in addition to the copper and silver coinage. Most of the gold seems to have obtained through trade with the Roman Empire. The gold weight standard of eight grams corresponds to that of Roman coins of the 1st century. Gold bullion from Rome would be melted and used for the Kushan mints, the Kushan were able to maintain and protect the Silk road, allowing silk, textiles or medicine to move between China and the West. In particular, many goods were sent by ship to the Roman empire, creating a flow of gold coins, Greek wine. Works of arts were imported from all directions, as indicated by the variety and quality of the artefacts found in the Kushan summer capital of Bagram in Afghanistan. 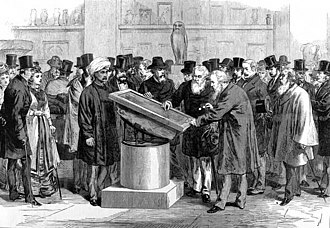 A strong artistic syncretism was stimulated, as indicated by the Greco-Buddhist art of Gandhara, Roman history relates the visit of ambassadors from the Indian kings to the court of Trajan, bearing presents and letters in Greek, which were sent either by Vima Kadphises or his son Kanishka. The title King of Kings was prominently used by Achaemenid Persian kings such as Darius the Great (pictured). The full titulature of Darius was Great King, King of Kings, King in Fārs, King of the Countries, Hystaspes’ son, Arsames’ grandson, an Achaemenid. 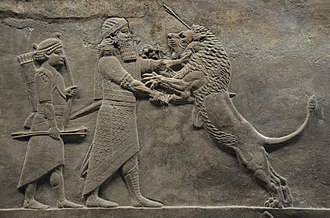 King of Kings was among the many titles used by King Ashurbanipal of the Neo-Assyrian Empire (depicted strangling and stabbing a lion). Coin of Huvishka. 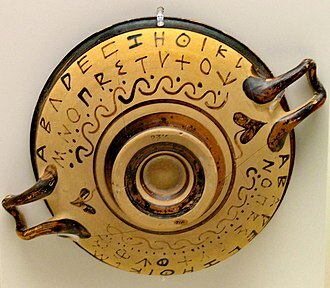 Legend in Kushan language and Greek script (with the Kushan letter Ϸ "sh"): ϷΑΟΝΑΝΟϷΑΟ ΟΟΗϷΚΙ ΚΟϷΑΝΟ ("Shaonanoshao Ooishki Koshano"): "King of kings, Huvishka the Kushan". Coin of Kushan ruler Huvishka (152-192 CE), featuring Maaseno, the incarnation of the Karttikeya of the Yaudheyas. By the 3rd century BC, the Yuezhi resided to the northwest of Qin China. Statue of Buddha found in the monastery of Fondukistan, Gurband Valley, Parwan. VII century AD. Guimet Museum. The Amb Hindu Temple complex was built between the 7th and 9th centuries CE during the reign of the Hindu Shahi Empire.